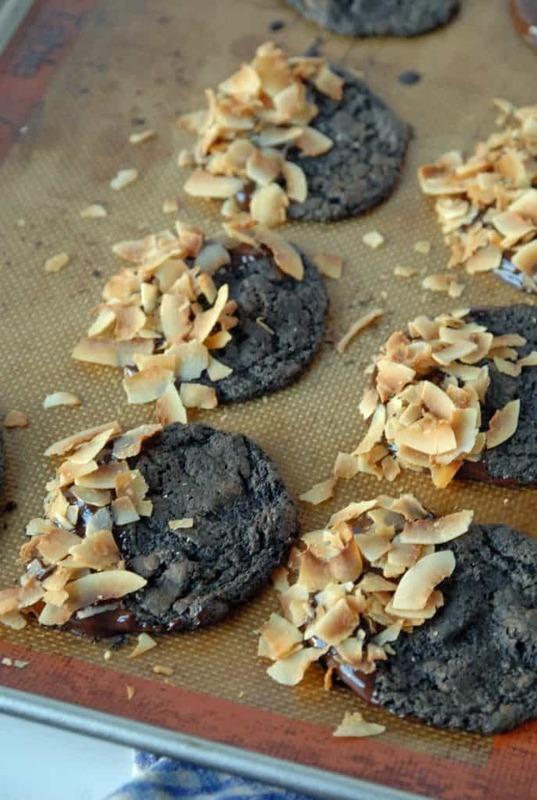 There are so many descriptors in this title that it seems a little excessive, but how else would you describe vegan chocolate cookies that are kind of like the edges of a brownie dipped in warm dark chocolate and sprinkled with toasted , flaked coconut? See what I mean! These chocolate cookies are beyond anything I would have thought they would be, especially since they were made out of an effort to use up leftover espresso powder I had hanging out in the cabinet. I wanted the base to be mainly chocolate, with no butter and very little flour, and it worked! The key to these is the freezing of the dough, making them crunchy on the outside and chewy on the inside, aka the best kind of cookies ever. 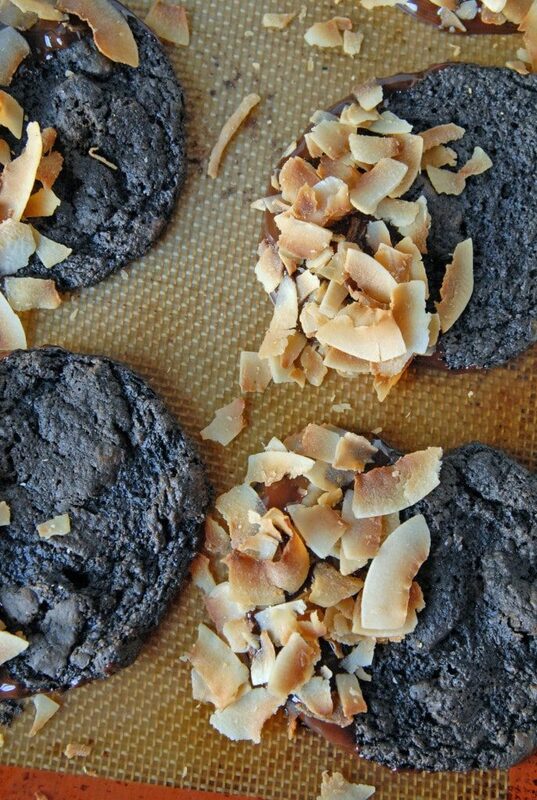 These cookies would be perfect on their own, without the dark chocolate dip and toasted coconut, but those are so worth the extra effort. 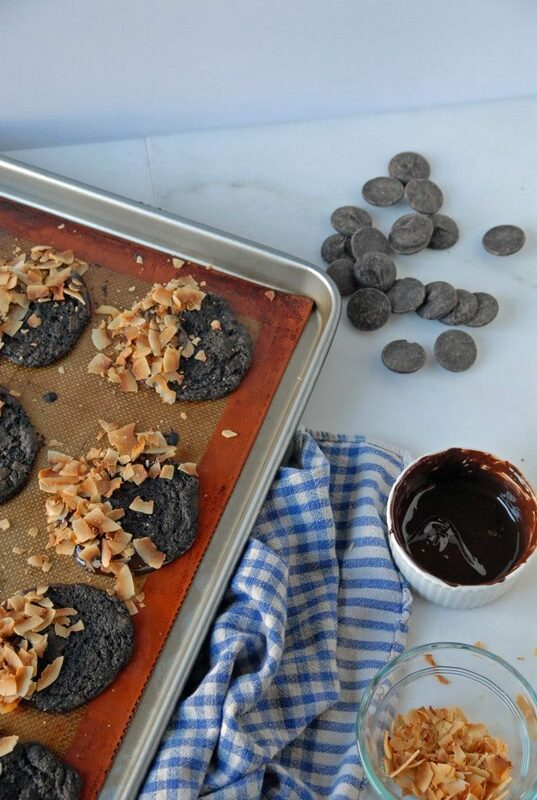 Also, can we agree that dipping cookies in chocolate and sprinkling them with coconut is probably the best after-work therapy there is (I mean, besides for wine)? 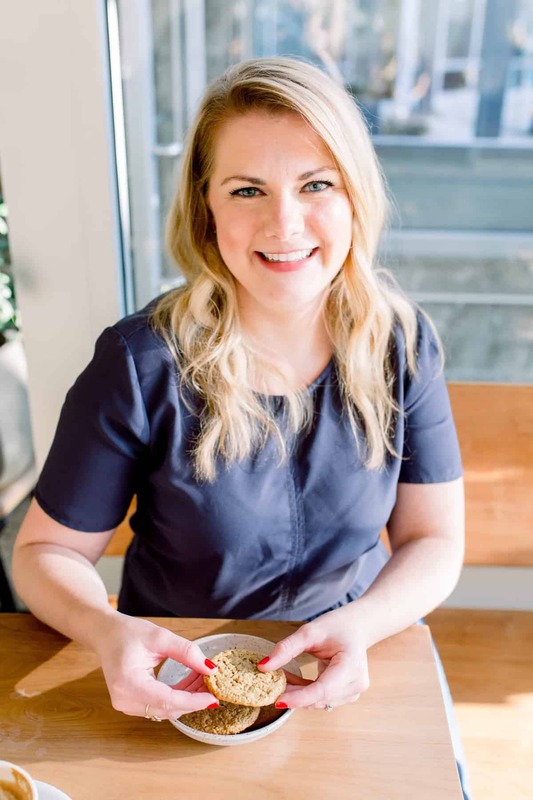 There is just something about concentrating soley on making sure each cookie has a thick chocolaty layer and juuuust the right amount of coconut flakes to take my mind off of the work day! I was fortunate enough for that the folks at Chocoley to send me a package of their vegan dark chocolate, which is also fair trade (double win!). I used their chocolate in this recipe and would without a doubt recommend using it in these cookies. They did send me the chocolate, but I am wholeheartedly in love with their high-quality product (and that’s my opinion!). Preheat oven to 350 degrees F. Line a cookie sheet with parchment paper or a Silpat baking sheet and set aside. In a medium bowl, combine the chocolate chips, water, and coconut oil. Microwave for 1 minute to 1 min 30 seconds, or until mixture is melted together. Watch carefully to ensure that the mixture does not burn. Remove from microwave. Mix in espresso powder, baking powder, baking soda, apple cider vinegar, vanilla, salt and whole wheat flour. Mix until thoroughly combined. If the mixture seems to start to solidify or seize, add a tablespoon of water to loosen. Stir in chopped dark chocolate. Freeze dough for 20-30 minutes, or until solid. Scoop cookie dough out into tablespoon sized balls and place on cookie sheet, spacing about 1 inch apart. Bake for 8-10 minutes. Cookies will be soft when removed from oven, but will become crispy as they cool. 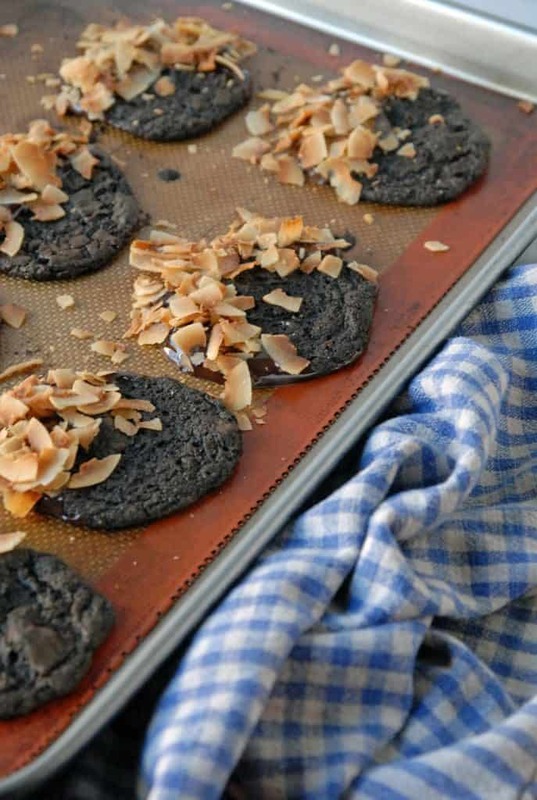 While cookies are cooling, toast flaked coconut in a 350 degree oven for 8-10 minutes. Keep an eye on the coconut, it can burn easily! Remove from oven. Melt together the 1 cup dark chocolate and 1 teaspoon coconut oil in microwave for 1 minute, or until melted. 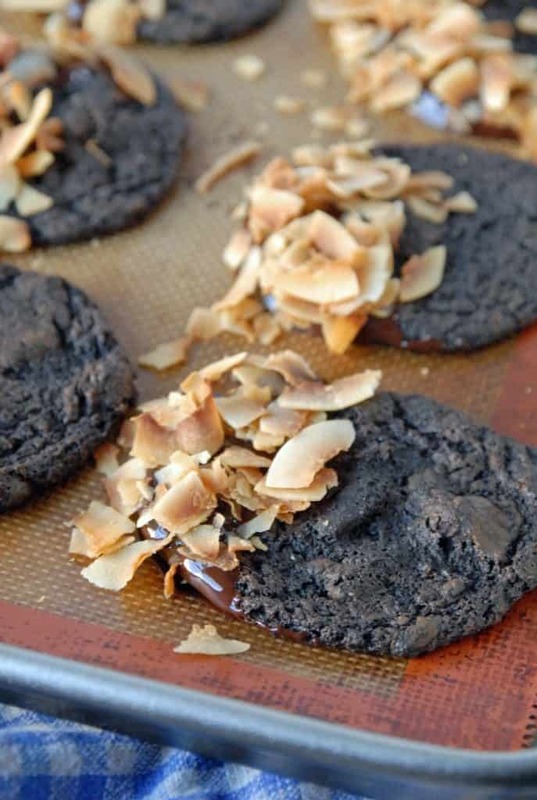 To prepare cookies: After baked cookies are cooled, dip cookies in the melted dark chocolate and sprinkle with coconut flakes. Allow to set in fridge or freezer until solid. Makes about a dozen cookies. Store in a sealed container at room temperature or in the freezer, depending on preference. These cookies are seriously making me drool over my computer as I stare at them (not attractive) lol! They look so pretty and chewy and delicious! 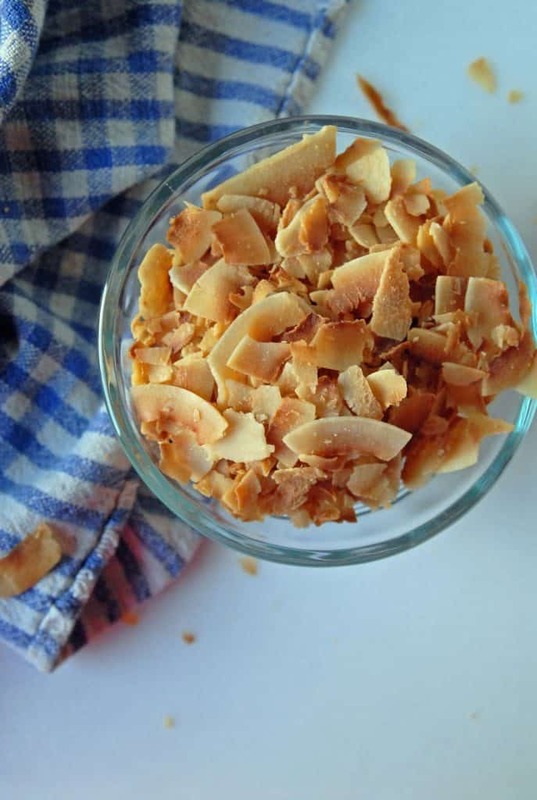 Love to toasted coconut topping, I’m definitely adding these to my baking list! Haha! It’s a winner, I’ve made them twice in one week already! 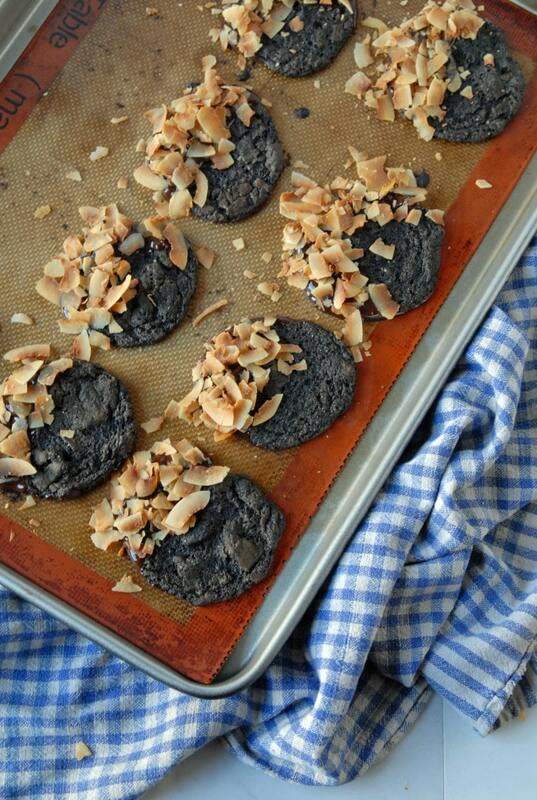 I LOVE chocolate and coconut, so this recipe is perfect!! Me too! Hope you love it! Soooo good Abby! Thanks for bringing!